Puerto Ricans love a party. Any occasion is a good occasion to bring out the music, food, and drinks. Besides the Fiestas Patronales (Patron Saint Festival) that every town has here, there is always some other type of festival happening somewhere. The festivals are usually in a town square or pavilion and can be large with a main stage and streets filled with vendors or smaller taking over a school or church parking lot. Either way there will be food, drinks, and music. 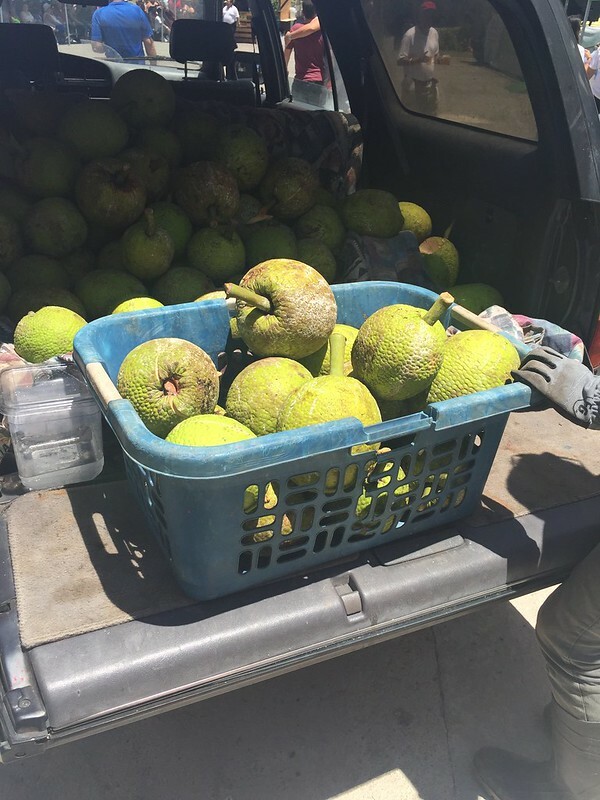 Pana, or breadfruit, is at its peak right now in the growing season, so it only seems appropriate that there should be a festival to it. 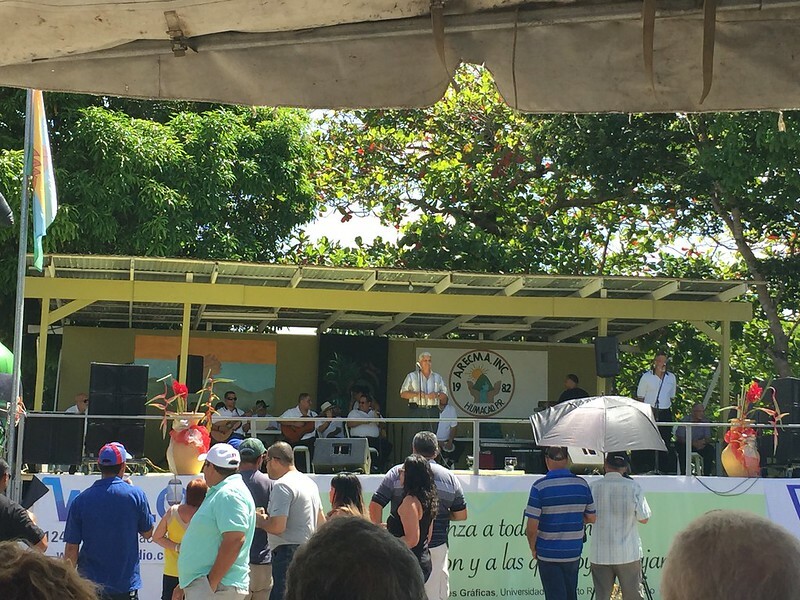 This weekend we went to the Pana Festival in Humacao. I’ve had breadfruit before but I’ve never cooked it and I want to learn eventually. If you haven’t had it, it’s a starchy fruit with almost the same consistency and flavor as a potato only just slightly sweet. It can be used in lieu of other starches. This was a smaller festival but it was still packed full of food stands, had a stage for dancers and musicians, a few artisan stalls, and some games and a trampoline for kids. First order of business was to get some Pana in our panzas (bellies). We bought a small appetizer of stuffed pana with meat for $1. 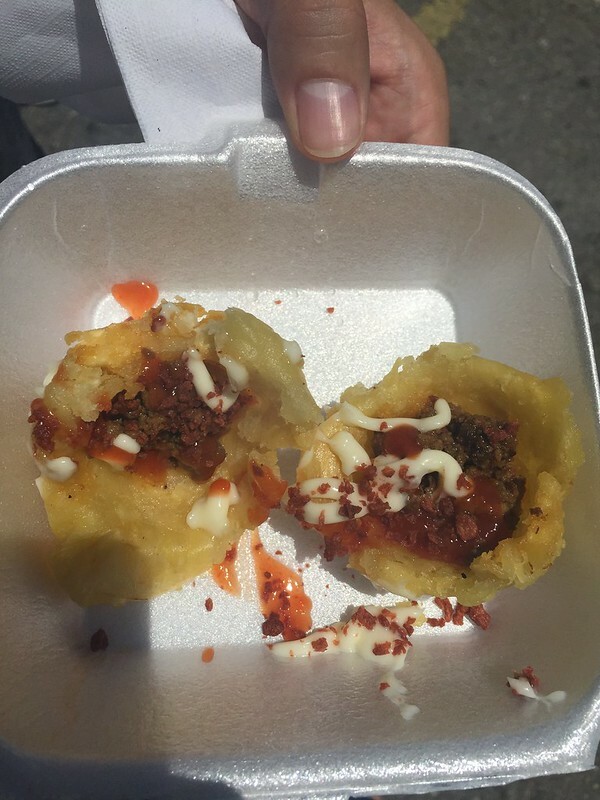 It was like a little fried cup of pana filled with ground beef and veggies. Really really tasty. The pana was lighter than a plantain which is what you can often find stuffed as “tostones rellenos” and the taste had just a hint of sweetness to it. 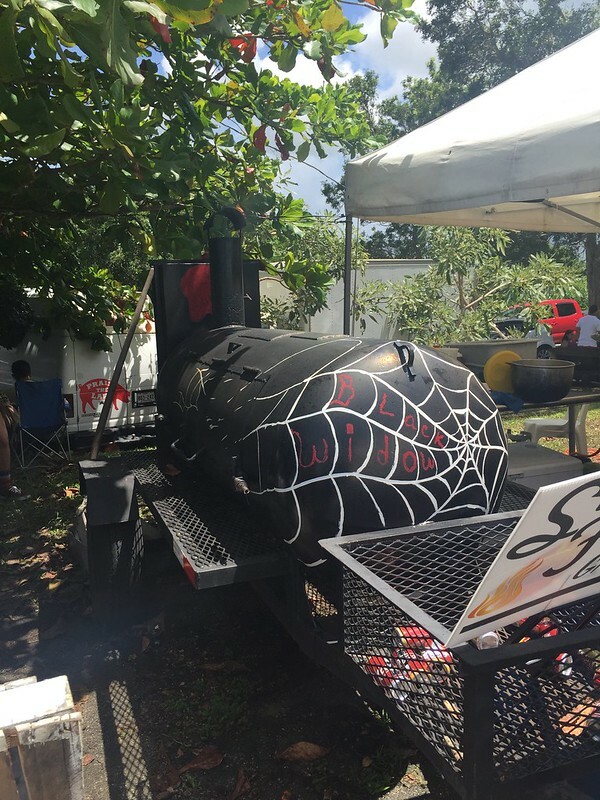 For our main course we had to try the smoked ribs from this Black Widow smoker. 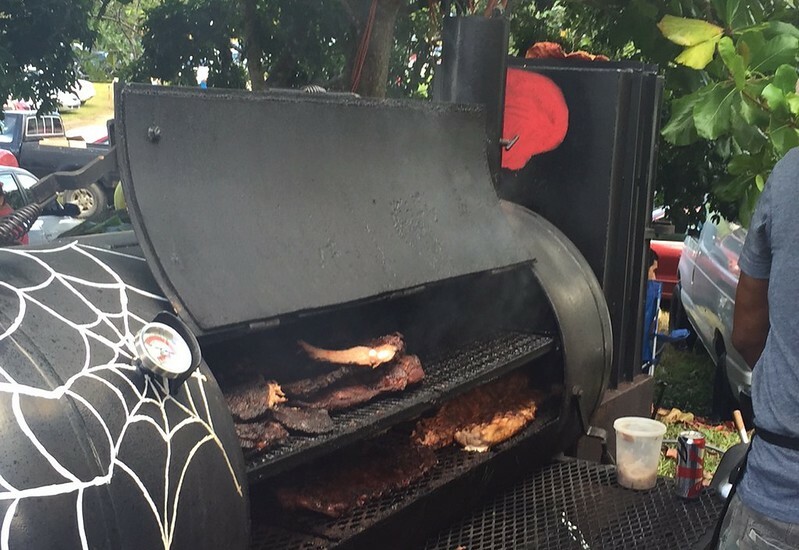 I realize they weren’t pana, which is what we were there for, but ribs are in my blood… How could we not?!? They season the ribs with coconut and use driftwood to smoke them. The side is called Viandas Majadas, which is a mix of mashed roots vegetables, usually taro, yucca, yam seasoned with spices. 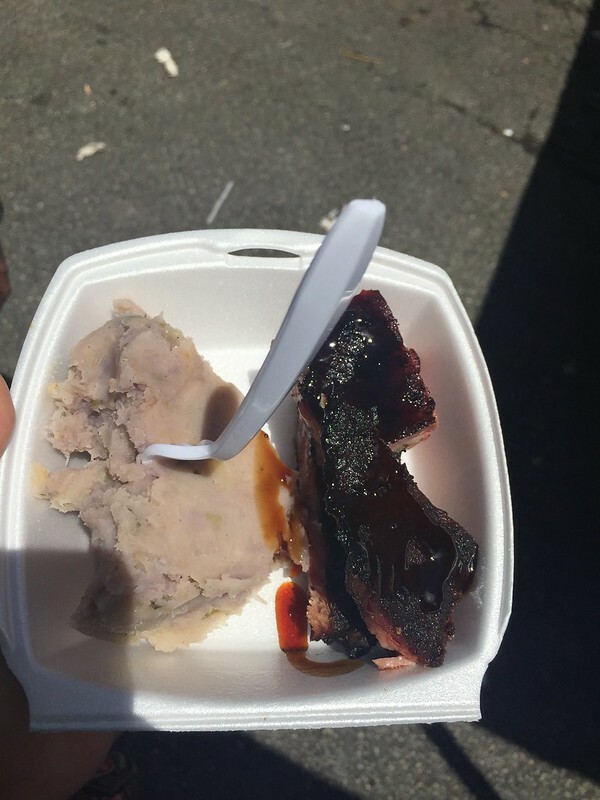 Both delicious, but the ribs…oh the ribs…. We lucked out with this festival because there was also a musical competition going on as well. It was the semi-finals for the trovadores competition of Puerto Rico. This style of singing is traditional Puerto Rican “jibaro” (countryside) music that has roots back to 15th century Spain and its colonies. There are two main elements to the music of the trovadores - the instruments, and the singer (the trovador). Traditionally the musical instruments are the cuatro, a 10 string instrument played like a guitar but shaped more like a large violin that plays the melody; a standard guitar that plays the chordal accompaniment; and the güiro, a scratch gourd that provides the rhythmic percussion. The trovador is the principal element in the music and sings or speaks lyrics that are poetic versus known as “décima”. The décima versus add up to 10-eight syllable lines that, in Puerto Rico, are sung to the rhythm of a musical melody called the seis. The décima poetry too has Spanish origins and can be found in many forms around the old spanish colonies. Singing the décima in Puerto Rico has become a competition in that the trovador is expected to improvise the décima on the spot. They are given a piece of paper with a topic on stage and then have to sing a décima based on the strict rhyme and syllable structure - the topic the torvador is given must be sung in the last line of the décima. The seis is played relatively slow and is designed for a good trovador to compose lines as they are singing. During the competition we saw, trovedors and trovedoras, were allowed to take a few minutes to think before they began singing and each sang 2 verses. Traditionally the trovadors have been men, but there were three women in the semi-finals, which is apparently a rarity. Everyone that sang was really good and very different. Some were very good singers, some were better poetically, but it’s amazing they could all come up with a couple verses under pressure so quickly. 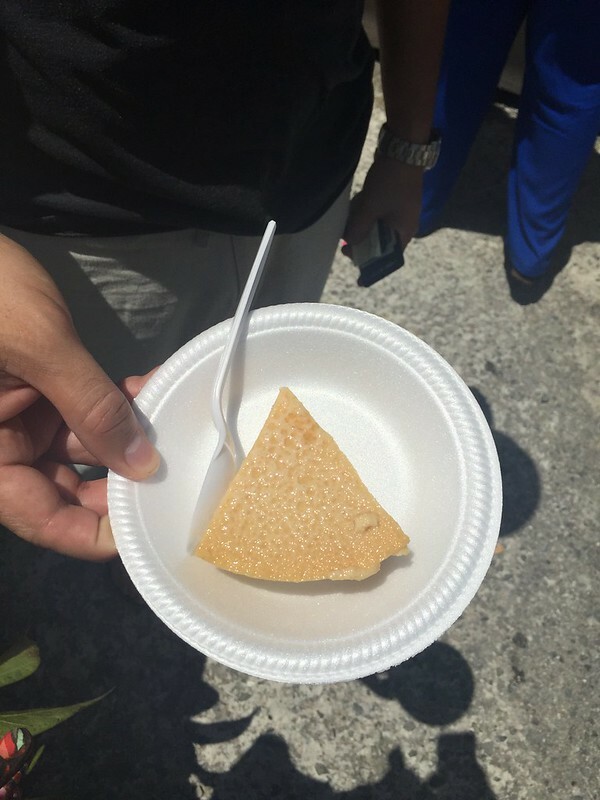 The whole day was great, it was a taste of both Puerto Rican cuisine and history, and a real example of why Puerto Ricans love any excuse for a party! !